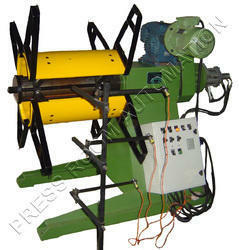 Motorized Decoiler with Hydraulically expandable jaws is used for bigger size coils ranges from 3000 Kgs. X 600 mm Width above material. 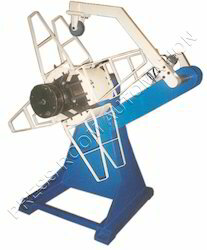 (mm) (mm) L. W. H.
All above equipments are designed for Line speed of 12-15 Mtrs. Per Minute. 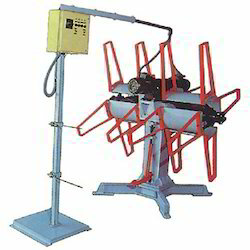 Twin Non-Motorized Decoiler is used to prevent loop between Decoiler & Straightener / Feeder & saves the coil loading time. It pulls the material directly from non-motorized Decoiler. It is normally used in Electrical Motor Stamping Lines. 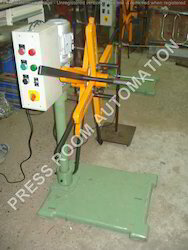 Motorized Decoiler suitable for coil weight upto 200 Kgs. X 150 mm width material. 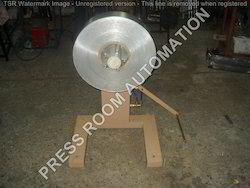 Motorized Decoiler suitable for coil weight upto 500 Kgs. X 150 mm width material. 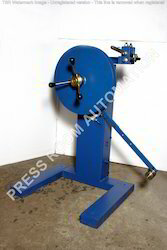 Motorized Decoiler suitable for coil weight upto 1600 Kgs. X 400 mm width material. 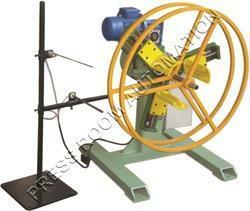 Pneumatic Decoiler is used for small size of Coil Weight from 50-100 mm & Width from 50-100 mm. 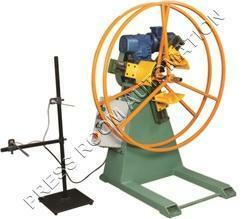 Motorized Decoiler along with hold-down snubber for holding the coil material from opening during Decoiling. It is recommended to use during decoiling high tensile material. Pneumatic Decoiler with fixed shaft for material comes on bobbin, suitable for plastic, thin metal strip, light weight material etc. 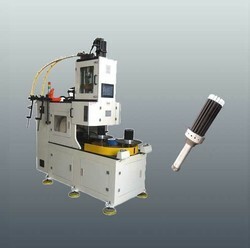 Pneumatic Decoiler with pneumatic type jaw expansion suitable for smaller coils comes on cardboard type bobbin. 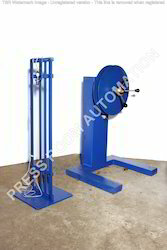 Motorized Decoiler suitable for coil weight upto 1000 Kgs. X 300 mm width material. 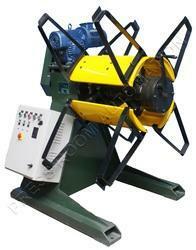 Motorized Decoiler suitable for coil weight upto 2500 Kgs. X 400 mm width material. 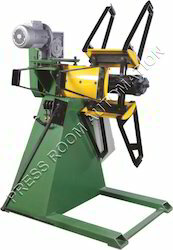 Motorized Decoiler suitable for coil weight upto 10000 Kgs. or 10 Tons X 1300 mm width material. By keeping track of latest developments, we are offering a wide range Double Motorised Decoiler. 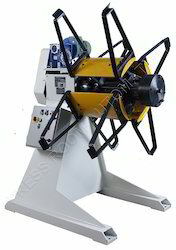 The offered decoiler is manufactured by using quality approved components and modern techniques in sync with industry norms. To cater the varied needs of our clients, this decoiler is availed in variegated sizes and designs. Apart from this, customers can avail this decoiler from us at budget friendly prices. Twin Motorized Decoiler saves the coil loading time, we can load two coils on two mandrels and use one by one by rotating the mandrel. 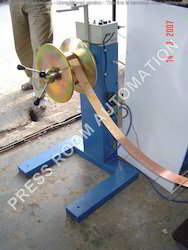 Weight kg Width (mm) Expansion Type Max (hp) from Floor L. W. H.
With an increased proportion of technology, we are offering a qualitative assortment of Strip Coiler. Backed by adroit professionals, this strip coiler is manufactured using superior quality components and advanced technology. 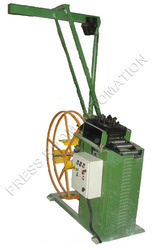 The offered strip coiler is checked on different quality measures so as to ensure its quality at clients’ end. 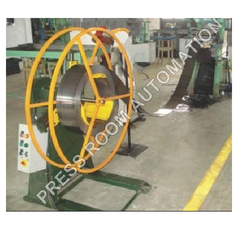 Moreover, this strip coiler is availed in diversified shapes and designs. 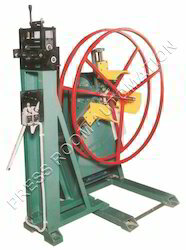 Tension winding arrangement by set of rollers for tight winding. Coil Hold-down (Hydraulic / Pneumatic) for Springy materials. Coilers with Shafting & Key to load Bobbin. All Jaws have fully covered drum for best stability. Pneumatically operated hold-down with potentiometer for speed variation & holding the coil with varying pressure with hand-lever. The Spindle would be driven by D.C. Variable Drive with gear-reducer & brake mechanism. D.C. Drive is in constant tension. Speed reduces automatically with diameter build-up for tight winding. Emergency Shut Off & Hold-down. Potentiometer to set the Tension manually. 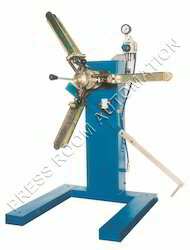 Hand-Lever operation for low tension in starting high tension in working. 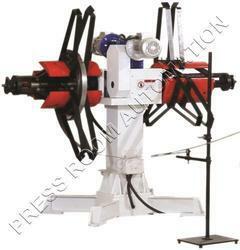 Pneumatic Coiler with tenstion winding arrangement suitable for winding plastic material. 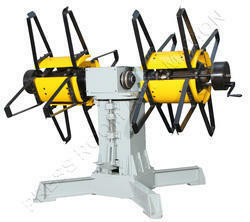 Pneumatic Coiler with narrow width guide & tension winding arrangement for tight winding of thin material. 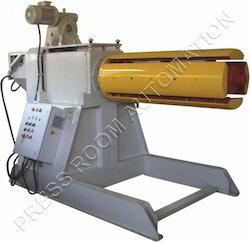 Pneumatic Decoiler with narrow width guide suitable for thin material. Economical Motorized Decoiler for smaller size coils. We are one of the leading manufacturer and supplier of Motorized Decoiler with Pneumatic Feeder. We obligated to meet the quality standards as per the customer demand. Looking for Motorized Decoiler ?